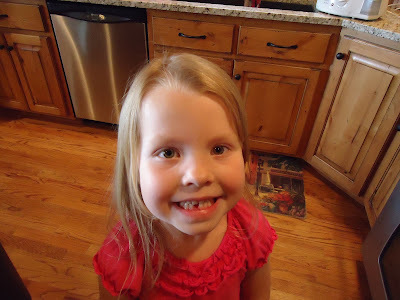 Lucy started telling me she had a loose tooth about a week before I went to Girl's Camp. With a day left before I was about to go, I started to get worried I would miss her first tooth coming out. I inspected the tooth (that she was constantly wiggling) and realized it was VERY loose. I told her that if she just gave it one big tug, it might hurt for a few seconds, but then it would be fine and probably come right out. She completely followed my advice and pop! The tooth was out! She was a bit shocked at first about the blood, but then she was thrilled and had to call both sets of grandparents. I was then shocked by how much older it made her look. Wow! Reason #6,476 why . . .